In celebrating International Tolerance Day, which is commemorate in every November 16, SETARA Institute studied and indexed 94 cities all around Indonesia in order to promote and practice tolerance. The indexing aims to promote the cities which were considered succeed in building and developing tolerance, so it should be affecting the other cities to follow. Report on Tolerant City Index 2015 is the first one that SETARA Institute conducted by focusing on tolerance practices in all cities of Indonesia by checking how the freedom of religion/belief is guaranteed and protected. The measurement using negative rights paradigm of freedom of religion/belief characteristics which is a part of civil liberties. More the State (local government) do not interfere the religion/belief life matters, then more tolerant the city will be. 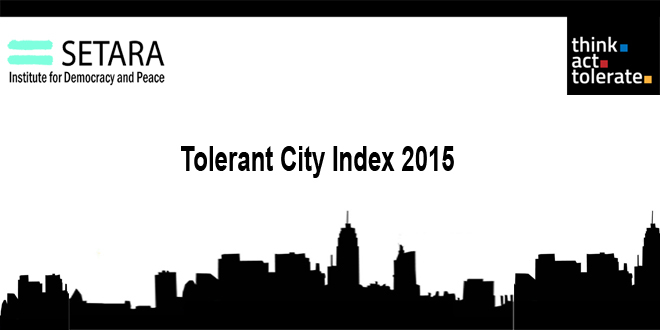 Beside negative rights approach, Tolerant City Index also checked positive acts of the government in promoting tolerance, whether in policies, official statements, responses on events, or in building tolerance among societies. Measuring tolerance had been done by many institutions in the world, even those who focussed on tolerance, freedom of religion/belief, or measuring tolerance as part of the embedded indicators in studying democracy. Some of those institutions are Freedom House (America), PEW Forum, andReligious Freedom Report ofMinistry of Foreign Affairs United States of America. In Indonesia, in recent year, there is Indonesian Democracy Index (IDI) hosted by Bappenas (National Development Plan Board) where they put freedom of religion as variable/indicator in measuring index. From 4 variables of civil liberties in IDI, freedom of religion/belief is derived to 3 indicators: written rules, officials act, and social violation threats. More specifically, Grim and Finke (2006) composed three main indicators to measure the degree of freedom of religion/tolerance in a country. Those indicators are (1) state rules on religion, (2) favouritism, and (3) social rules. These indicators were introduced by Grim and Finke also adopted by Bappenas and other institutions. In measuring Tolerant City Index 2015, SETARA Institute also used Grim and Finke framework by modifying it with another variable, religion based demography. The object of the research were 94 cities from the total of98 cities all around Indonesia. The compilation of administrative cities in DKI Jakarta become a city of Jakarta based on the assumption that the administrative cities have no authority to issue a law/rule, means, become invalid to be measured separately. The reason why we chose cities as the research objectbased on consideration that the compositionof citizens in cities/urban should be more heterogeneous compared with the district (kabupaten). This heterogeneous and cosmopolitanism should show high tolerance. Another reason is based on practical consideration, which is to ease research activities, comparing if the research was done by taking all the 514 cities/districts in Indonesia, including 5 administrative cities in DKI Jakarta.